Hello All, Im looking for some help with the make and model of this 60's? runabout i picked up. There is no transom plate and the only thing I have to go on is a marking on the windshield that says 1966. Maybe Sears/Elgin? 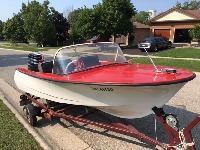 The original engine is an Evinrude 28hp. Any help would be appreciated as the previous owner has no idea and I would love to know. Canât say I know anything about the boat. However, the top hat of the Merc is chrome and so is the lower surround bracket... I believe 1967 was the last year for that chrome. The decal on the wrap looks like the 1976 and or 1977 era. The white controls would match the older mid 1960s vintage motor. Others can hopefully offer more help. Thanks for the reply, that's kind of what I thought for the Merc but its not the original engine so I don't believe its helps much. I'm hoping someone else will chime in and lend their expertise. I have added some pictures now that i have it running.